The Seattle Roadster show was a three day event. It seems though that it always worked out that for several nights before the event, you were preparing into the early morning hours. There is always a lot of special preparation and detailing to get your car ready for the white glove treatment. This of course means that you will need to have the entire undercarriage absolutely spotless. The variety of cars entered in a large indoor show such as the Seattle Roadster Show is quite interesting and usually presents something for just about everyone to enjoy. It's rare to see a true classic car in such an event though. They are usually displayed at shows like the Kirkland Concours d' Elegance or Pebble Beach and Forest Grove Concours d' Elegance. I personally like the cars that are more toward the restoration side rather than the custom or modified side of the spectrum. Classic Car Shows are always interesting as they are almost always geared toward correct restoration. Slight modification, sometimes to me is fun and really quite practical when it comes to bringing some of the early cars up to a level that makes them functional on today's highways. This doesn't mean you will need an independent aftermarket front end, disc brakes, and a computerized engine and transmission. You certainly don't need a 9 inch Ford rear end either. It's a strong one but if you're not drag racing with a 600hp engine, it's way overkill, and there are plenty of rear ends out there that will work fine for less money. To me, there is something to be said about using "real car parts" and personally orchestrating a work of art that is both reliable and highly functional on modern roads. Following a "theme" in building that work of art as though it was built by a true hot rodder from the 1950's is what turns my crank. I also like to make subtle upgrades that are almost undetectable by the average car guy. This is what I did with my 1937 Chevrolet Pickup Truck. Because I built my truck so different than the majority build their cars, it is something that most people question. I wanted it to look like a 1937 Chevrolet Pickup and not a plastic replica car. In other words I want my outside door handles, hood ornament, original mirrors and all the trimmings that this truck came with. When you open the hood, it still looks like a vintage truck engine, not a modernized kit car. I did use some vintage speed equipment on it but nothing you can buy off the shelf or out of any magazines. When you look in the bed of my truck it looks like a truck bed, not some funny furniture. 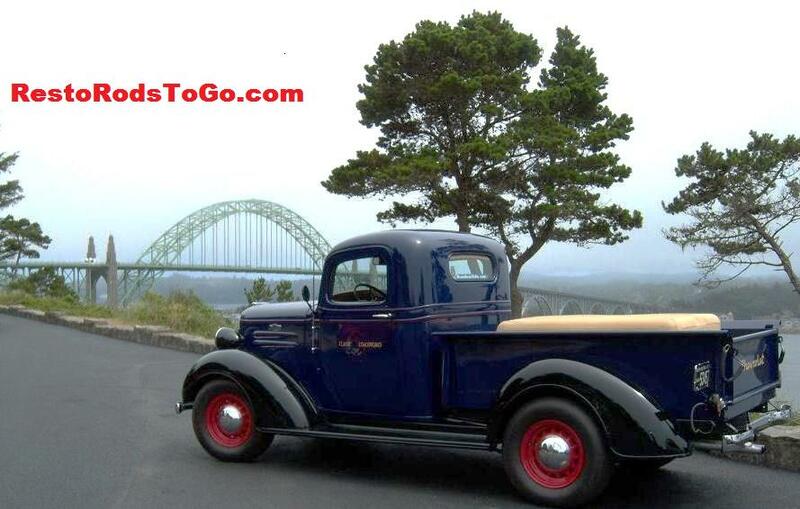 In order to make a point, I drove my drum brake, 6 volt, 6 cylinder 1937 Chevrolet Pickup Truck with 1941 running gear and a R-10 modified overdrive from coast to coast and back on a solo trip in 2007. Cruising speed was 70 mph for most of the trip. It handles fine a 80 mph too but it runs real smooth at 70. During the show when I and a couple friends were looking at the cars at the show, we were admiring a 1950's open Cadillac that was a very nice restoration, but it had a cut rate parts store battery in it. That stood out like a sore thumb. As we where looking at it, another guy came up and also made a comment about that battery. In talking to this guy, the question came up "what's your favorite car here?" His answer was "that blue 1937 Chevrolet Pickup". Shortly thereafter he shared that Harley Earl was his grandfather. Was his choice based on the fact that his grandfather was doing the design work for General Motors at that time period?